The play’s subtitle, “A Trivial Play for Serious People,” is rather telling. Back in 1895 when the work premiered, I’m sure it was the toast of the town. In modern times, however, it’s a bit hard to swallow the importance of the absurd plot, but theaters keep presenting it. A Broadway revival a couple of seasons ago even added insult to injury by casting Brian Bedford as Lady Bracknell, one of a few interesting stage roles available to women of a certain age these days. All that to say, imagine my surprise when I actually found myself chuckling at Playhouse on the Park’s production. Credit for that, among other things goes to Jerry Winters’ direction, which carefully arranges the ensemble actors around Christopher Hoyt’s set during the action and in between (when costumed stage hands and actors help switch out props to convert a morning room into a garden setting as if they are getting things I norder for expected guests). The blocking by Winters, who helped Lend Me A Tenor last season at the Playhouse, helps tell the story (and gives it a bit more credence). In addition, most of the actors managed believable English accents (Dialect Coach Jennifer Scapetis-Tycer just needs to tweak the pronunciation of the word “Aunt” which, unfortunately, comes out sounding like “Uncle”) and solid performances. Katrina Ferguson is a formidable Lady Bracknell and Laura Hankin gives a standout performance as innocent Cecily. In this tale of a country gentleman, Jack Worthing (Michael Raver) invents a troublesome brother named Ernest, whose troubles afford him the opportunity to leave his country life, dominated by his young ward, Cecily (Hankin) and her tutor, Miss Prism (Donna Schilke), and go to more exciting London, where he assumes Ernest’s identity. 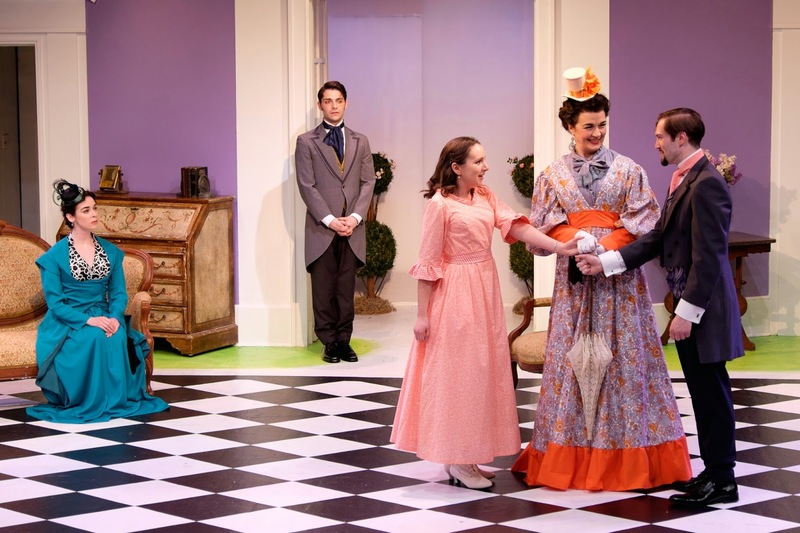 In town, he hangs out with friend Algernon (James Perenti) the love of his life, Archie’s cousin Gwendolyn (Jane Bradley) and her mother, the Lady Bracknell (Ferguson). Archie, finds spending time with all of them a bore, however, and invents an invalid friend, Bunbury, whom he pretends to visit in the country to avoid the social obligations of town. There are some other characters -- Lane, the butler, and Merriman, another servant (both plyed by a drole Harrison Greene) and the vicar Chasuble (Davd Farrington) – thrown into the mix. Mayhem which ensues as Algernon impersonates Ernest, Algernon falls in love with Gwendolyn, both Cecily and Gwendolyn think they are engaged to Ernest, both women vow they could ever love a man not named Ernest – OK that’s where my brain explodes with the plot -- and secrets come to light about a baby left in a handbag at a train station. If that description doesn’t leave you rolling in the aisles -- you’ll be scratching your head just like I do when audiences roar at the stuff – you might actually find yourself chuckling at it this time. Particularly well done is a scene between Cecily and Gwendolyn where the women form an immediate friendship, then discover they might be engaged to the same man, all while maintaining the requirements of social etiquette. Hankin brings a fresh, engaging edge to the role, which makes watching this farce a delight. So whether you have seen Ernest 100 times or somehow have managed not to see the incessant productions of it offered at every theater company in America, check out this surprisingly watchable version. Ernest runs through May 3 at Playhouse on Park, 244 Park Road, West Hartford. Wednesdays and Thursdays: 7:30 pm; Fridays, Saturdays at 8 pm; Sundays at 2 pm. Tickets $15-$35 (860) 523-5900 x10; www.playhouseonpark.org; box office 244 Park Rd., West Hartford. A special senior matinee is planned for April 28 at 2 pm with all seats priced at $22.50.